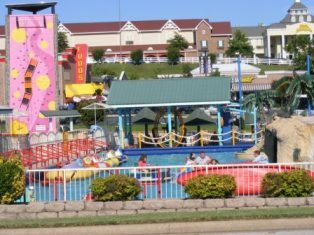 Fun parks are located throughout the Branson MO area. These are great destinations for your summer travel, especially if you are traveling with kids! 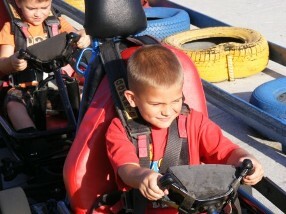 The Track Family Parks has 4 locations in the Branson area. Each differing site offers activities from go-carts, mini golf, and kid’s rides to arcades, laser tag, even a giant sky coaster. Go-Cards may be purchased and used at any park. The whole family can use the same card with unlimited half-price rides, mini golf, and arcade games. The Go-Card will also get you a half-price discount on the Ozark Mountain Skycoaster and the Lazer Runner, plus a FREE sundae from Andy’s Frozen Custard located at Track 4. Are you planning to see any shows, have dinner, or visit other attractions? Show your Go-Card and receive discounts at participating locations. Go-carts aren’t the only thing at Track #3. You'll also find Bumper Boats, the Lost Mine Miniature Golf and of course the arcade. Kiddie Kountry is also at this location complete with kid’s rides including Kiddie Go-karts, Kiddie Bumper Boats, the new swinging Pirate Ship and more amusement park rides. 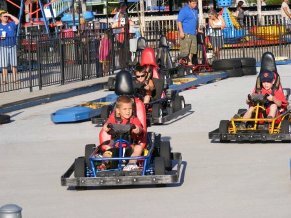 The Kiddie Go-Carts ride is for children 38" tall and at least 4 years old. Discover the Classic Go-Carts at Pirates Cove. Go for a drive if you are over 54"
This is in the 76 WEST AREA and is just east of the Lodge of the Ozarks & Hughes Brothers Theater.